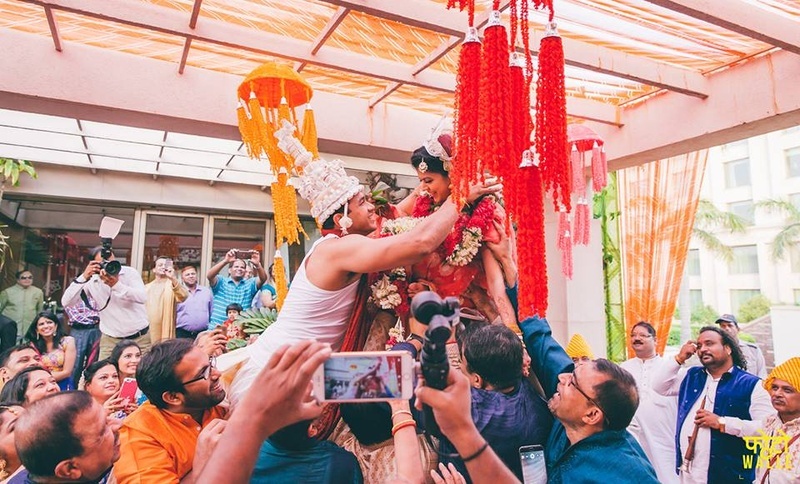 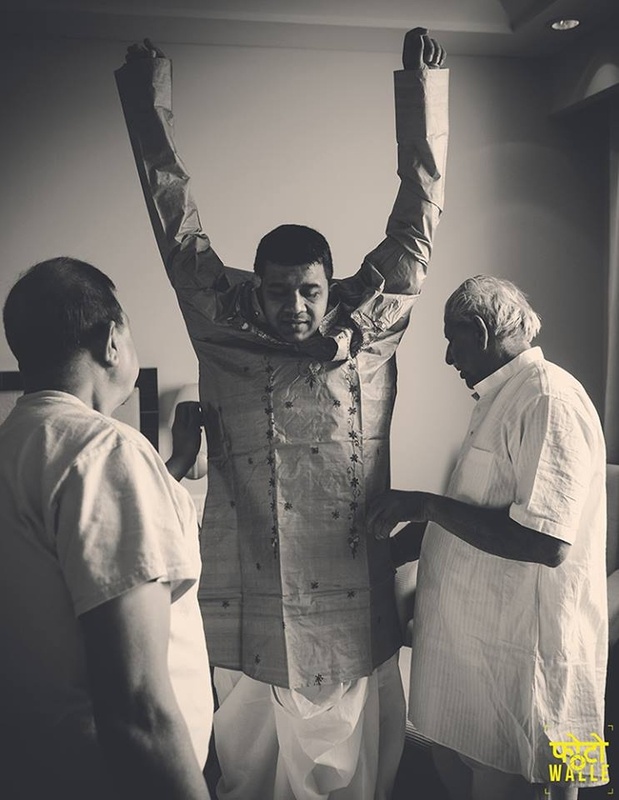 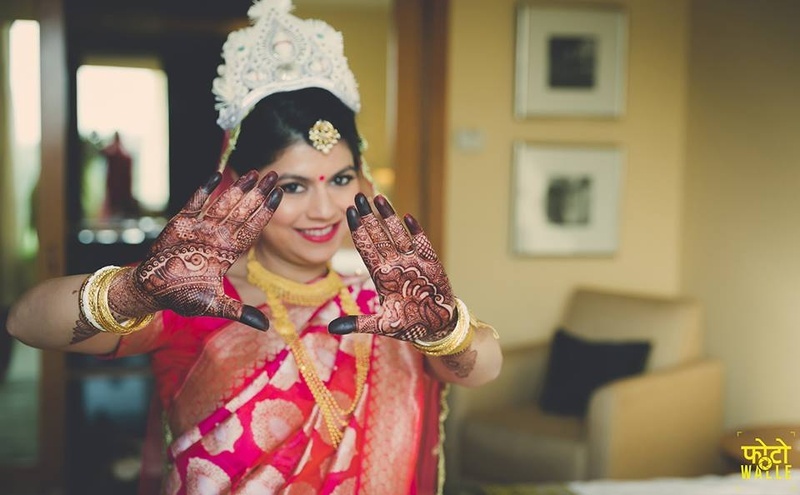 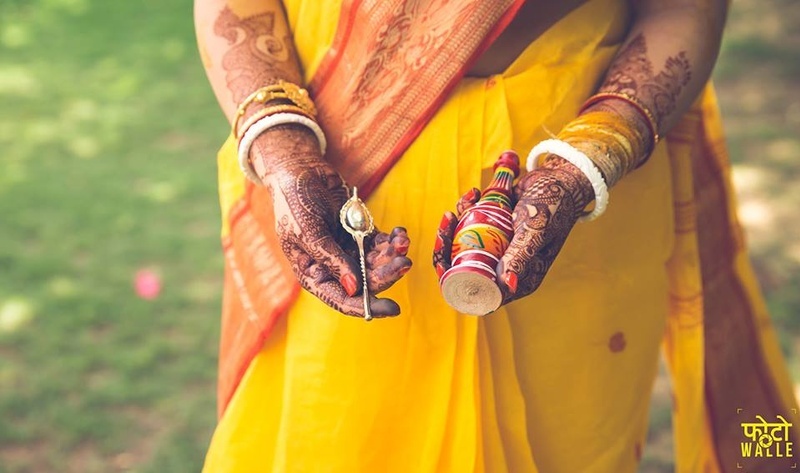 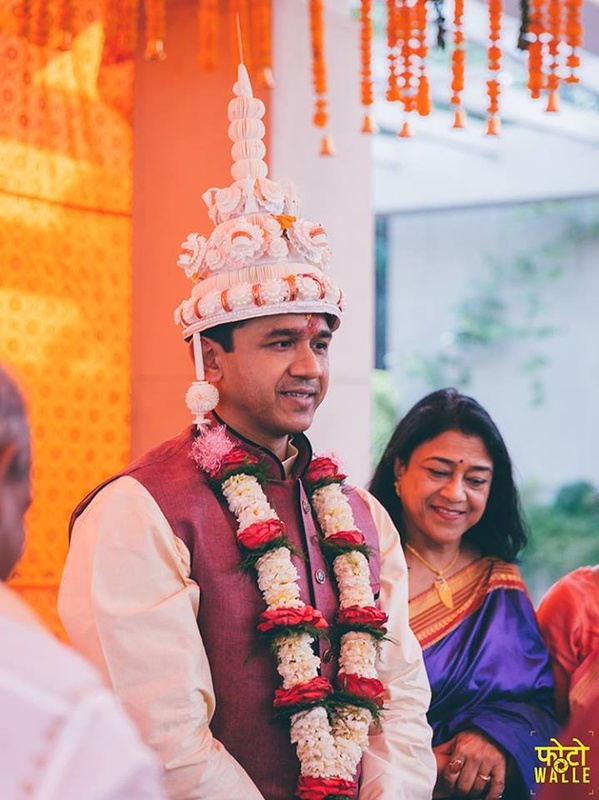 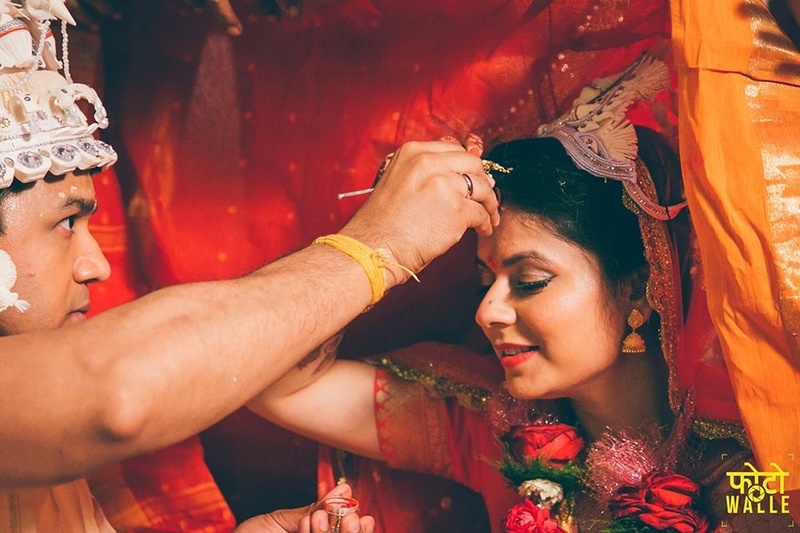 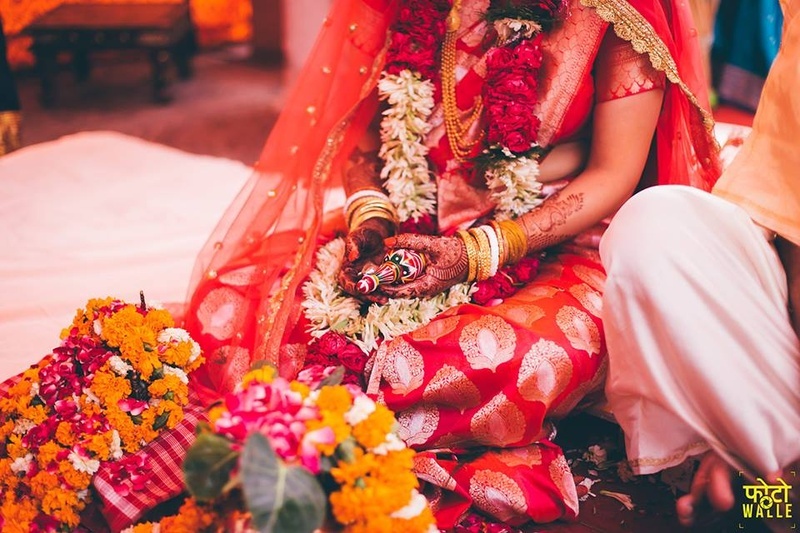 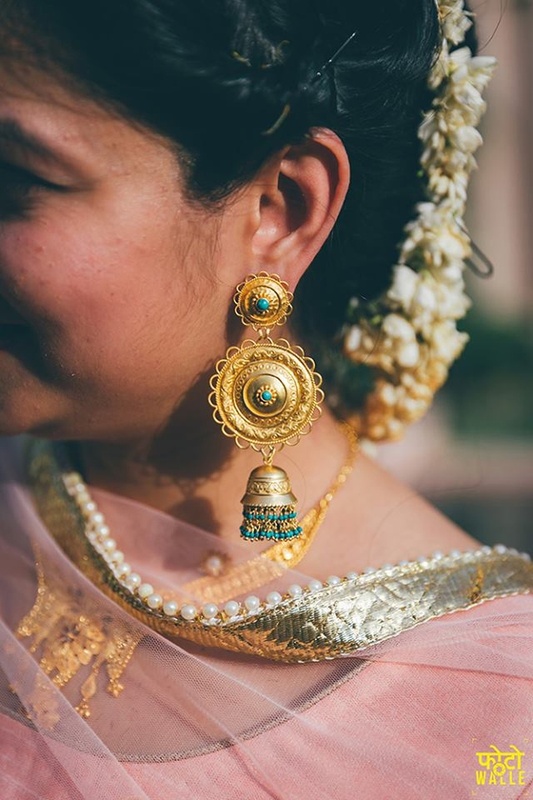 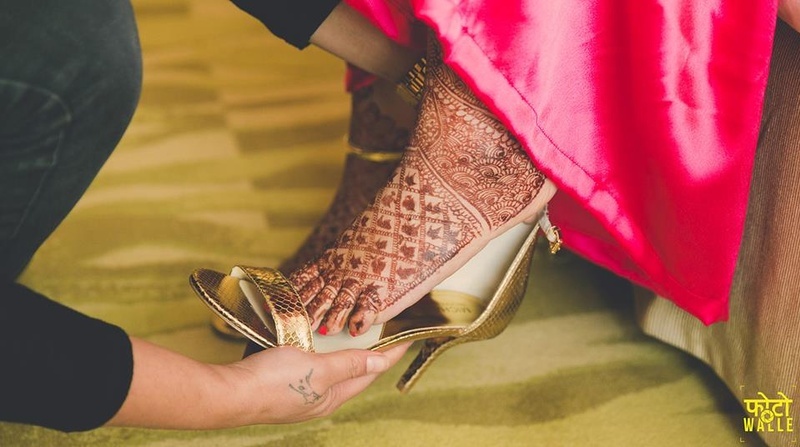 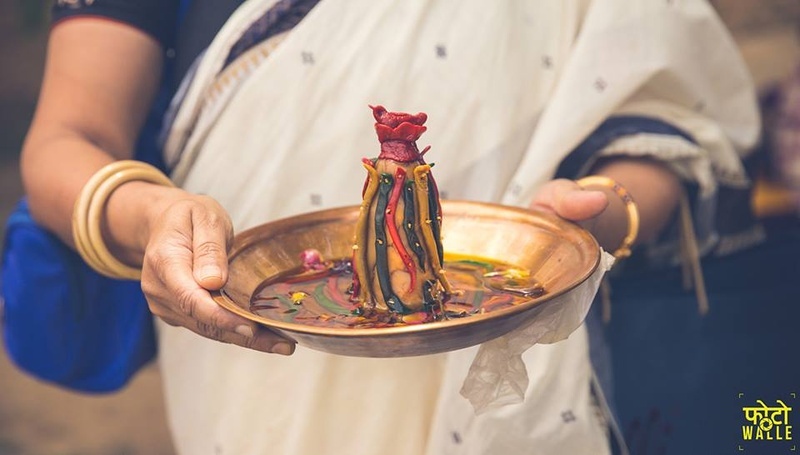 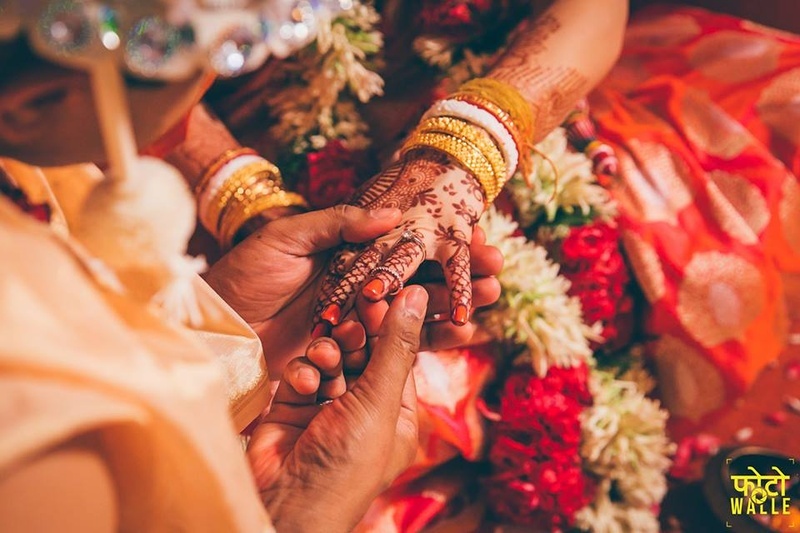 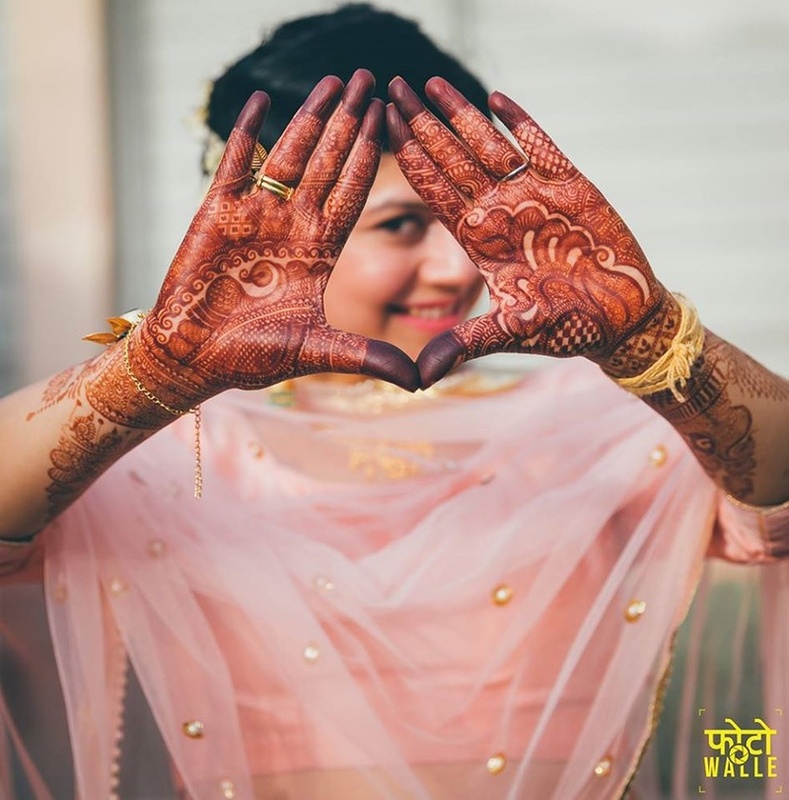 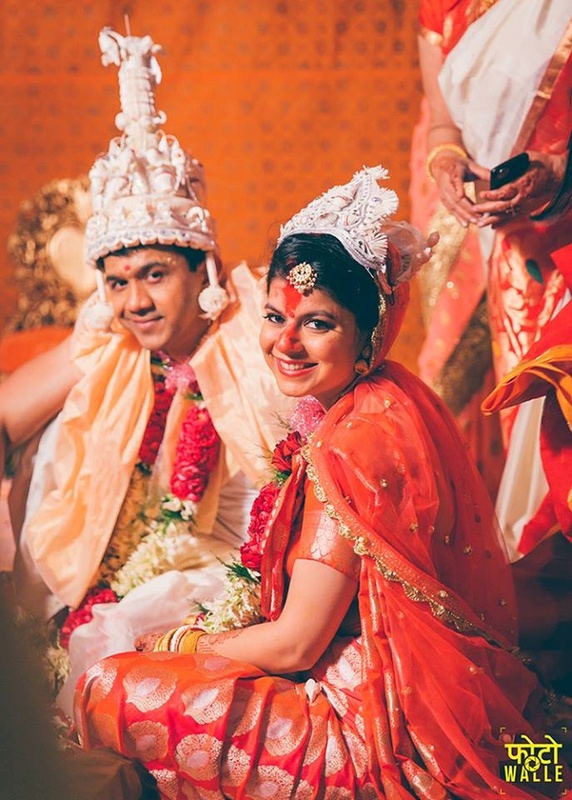 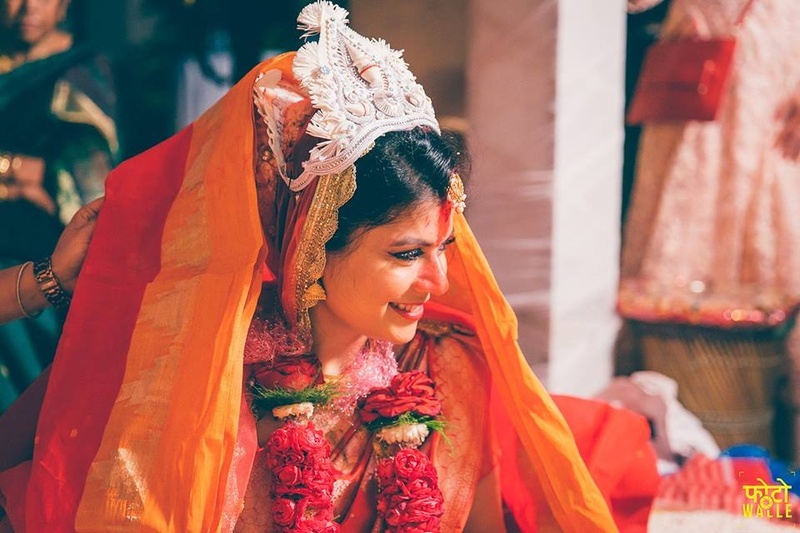 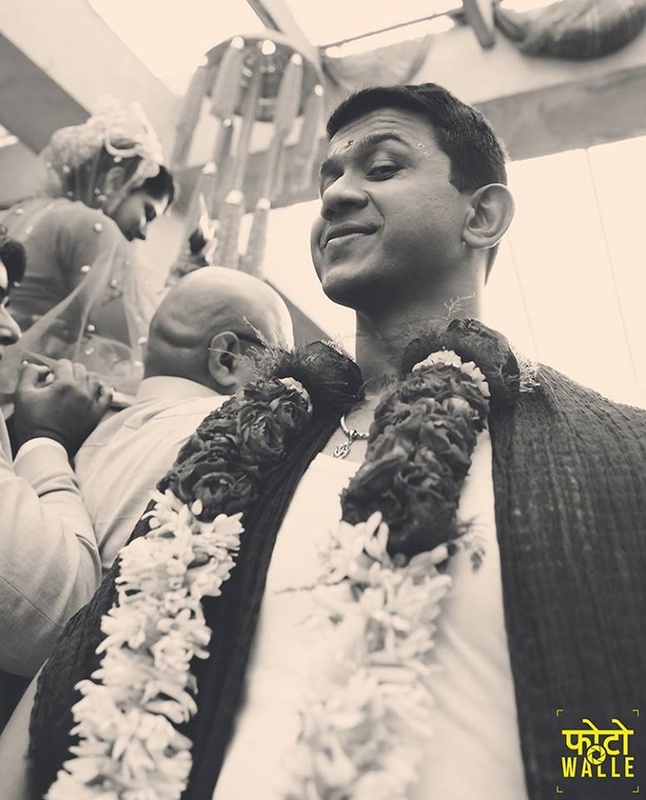 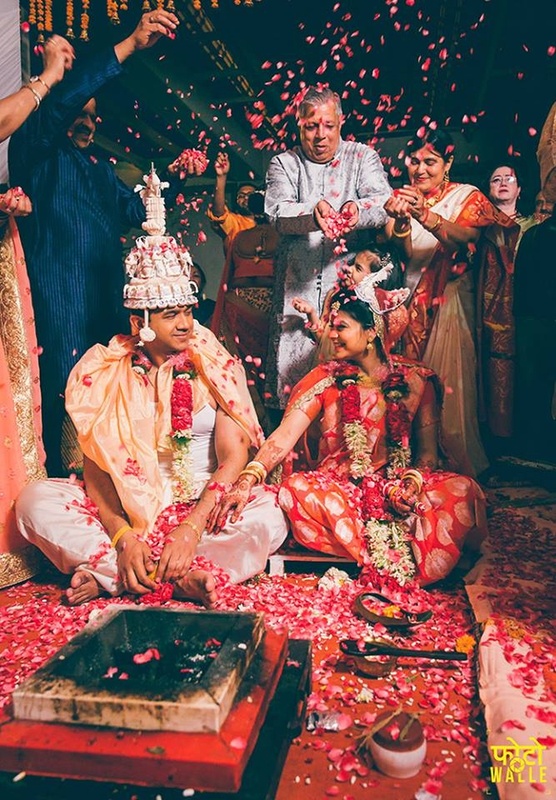 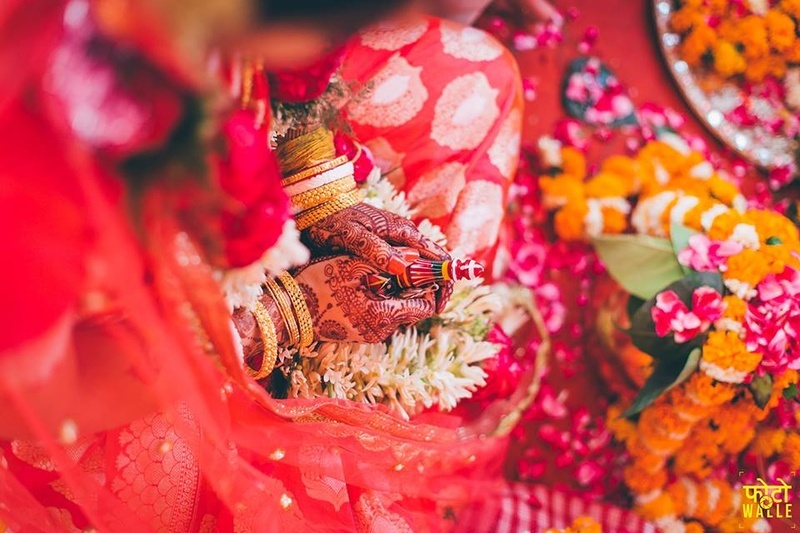 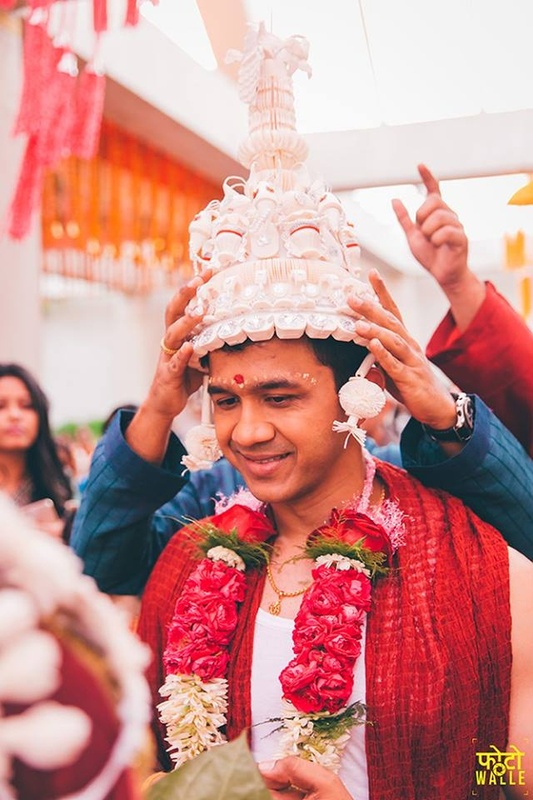 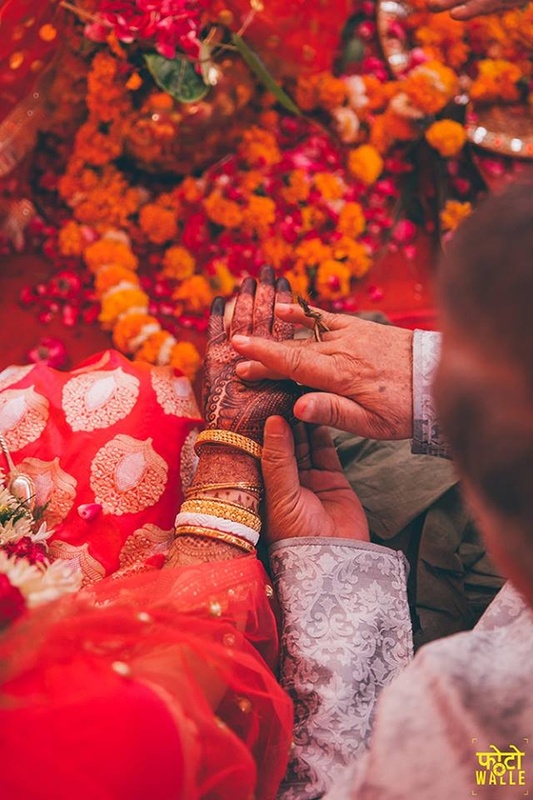 Little latkans, detailed dori work on the groom’s kurta, and the bride’s minimal jewellery – this beautiful Bengali wedding was all about the details, it was all about the love! 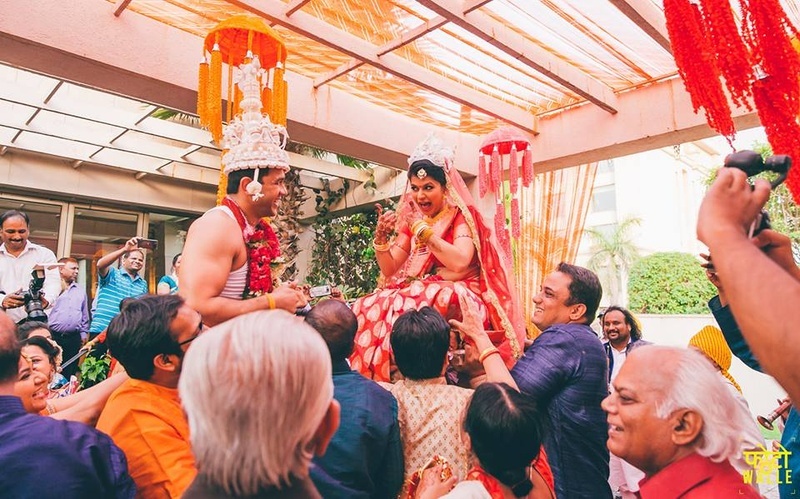 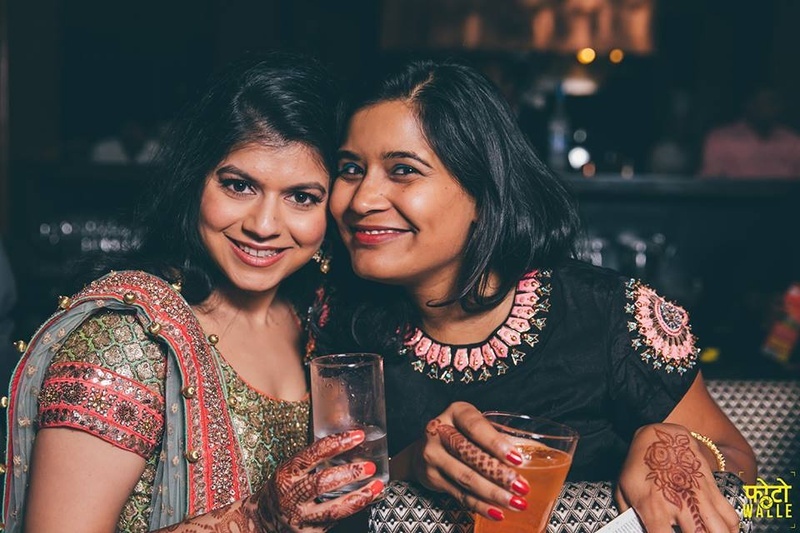 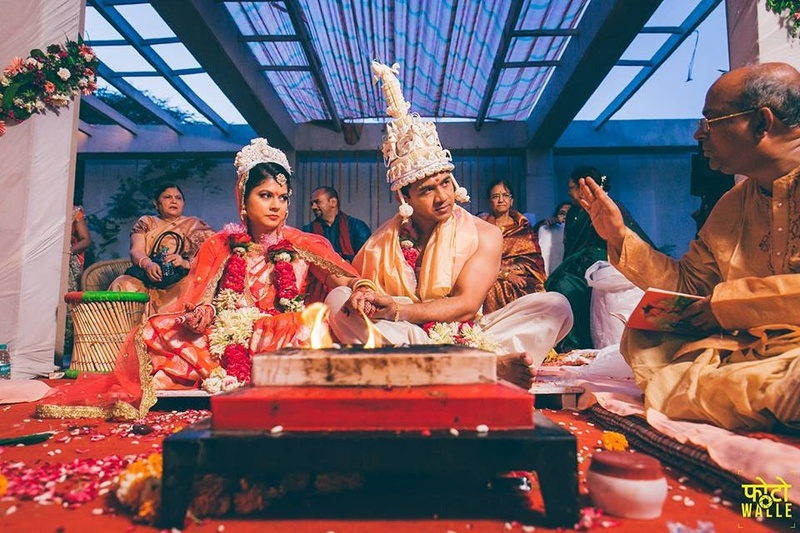 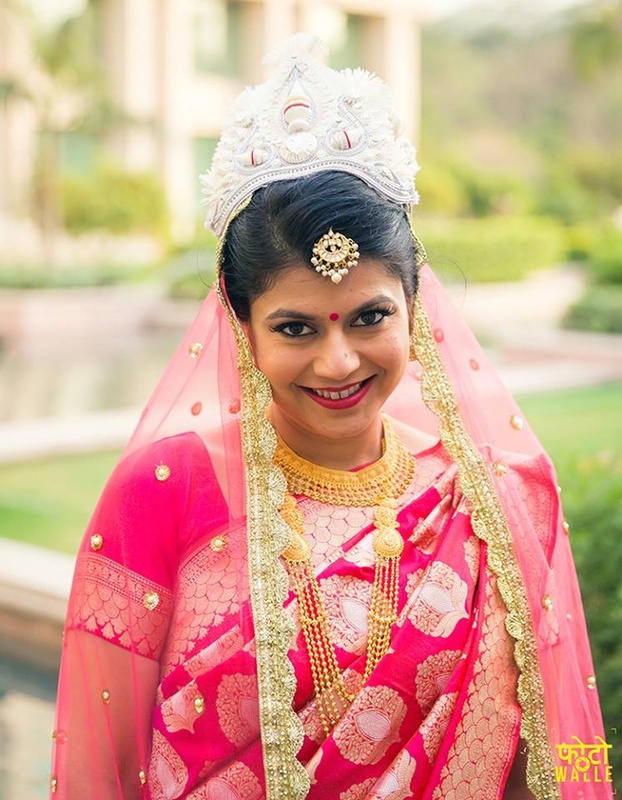 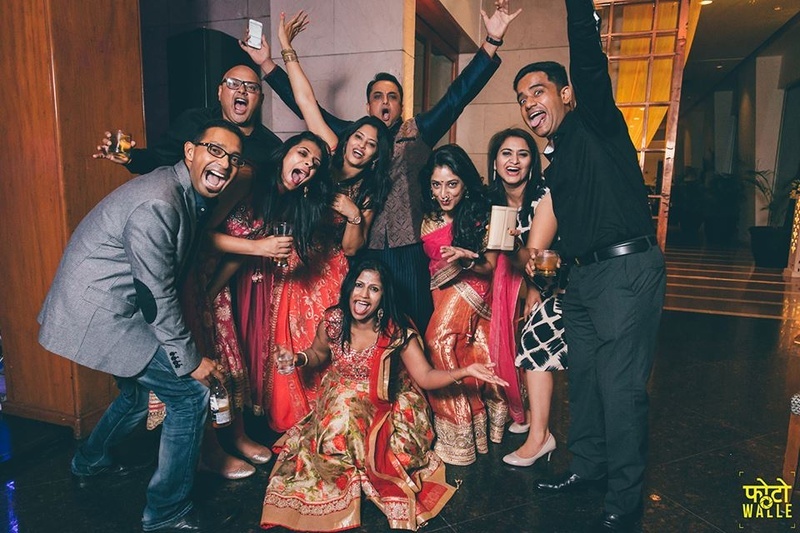 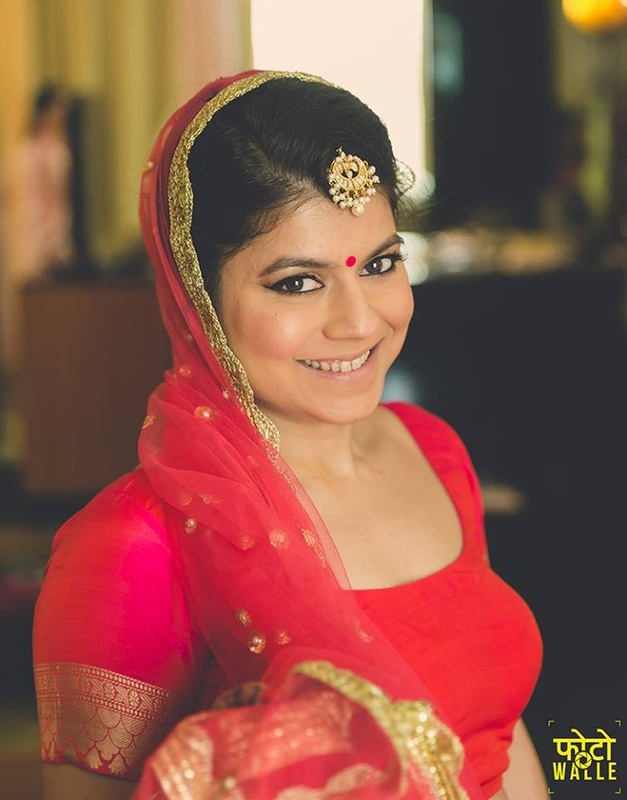 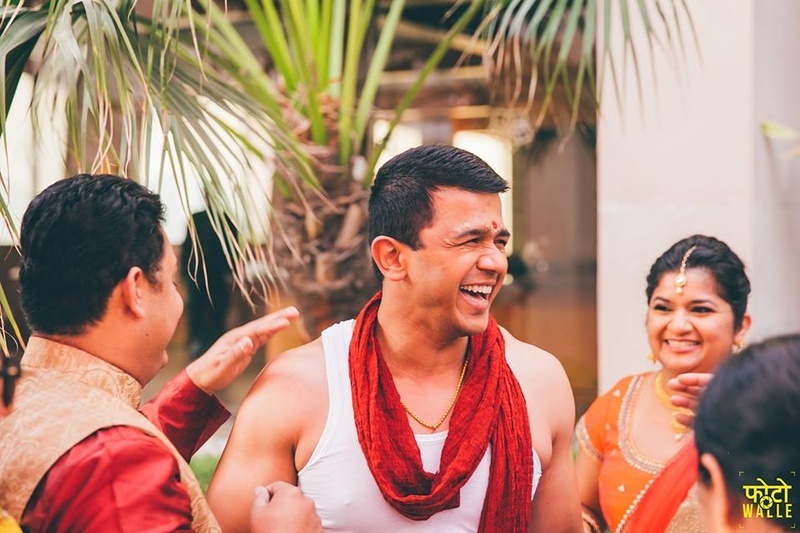 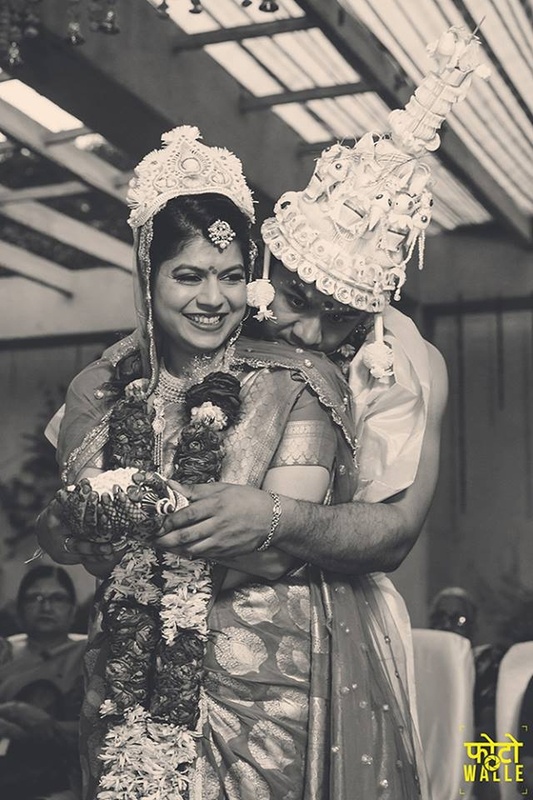 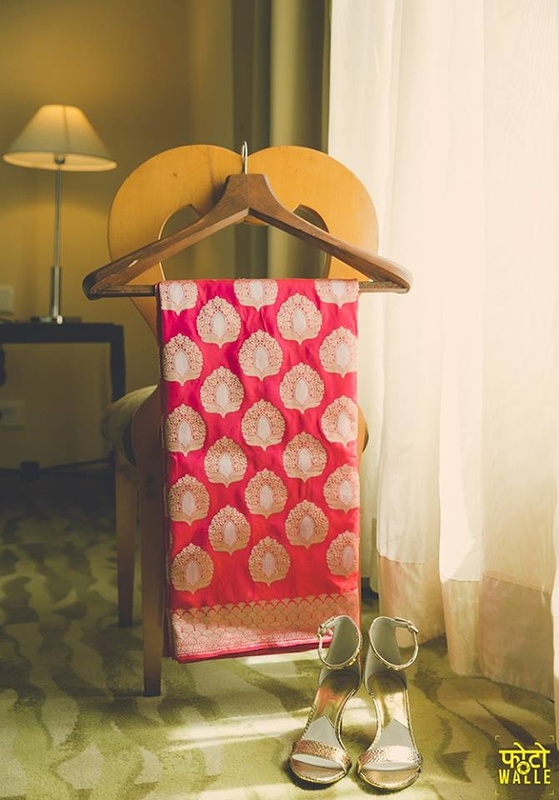 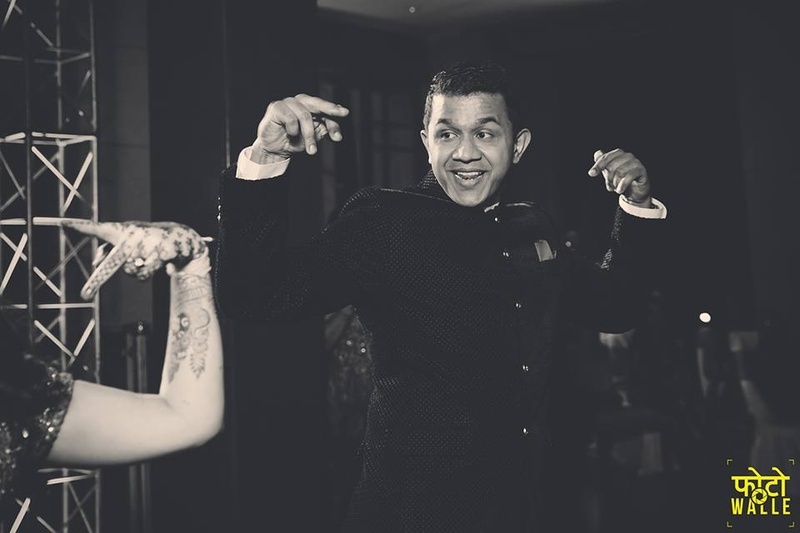 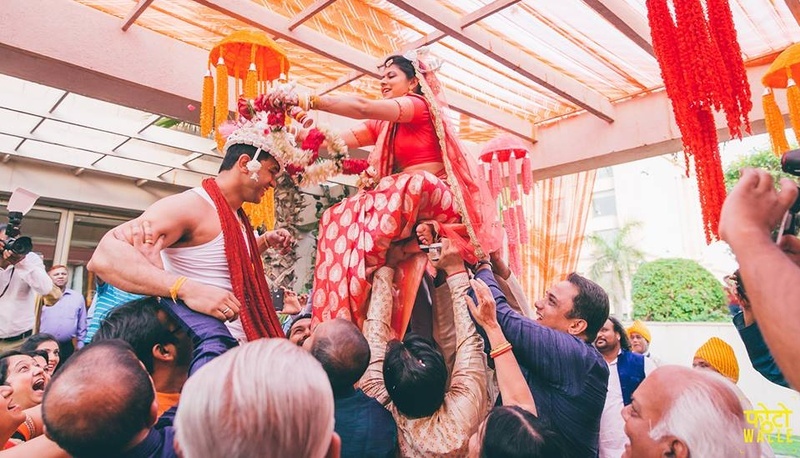 Sid and Rupa had a sweet, intimate two-day wedding held at The Grand Vasan Kunj, New Delhi! 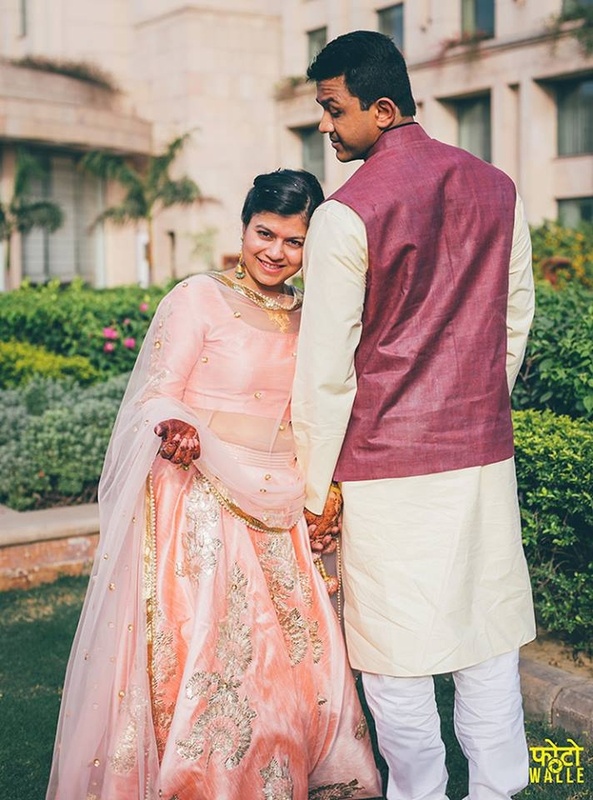 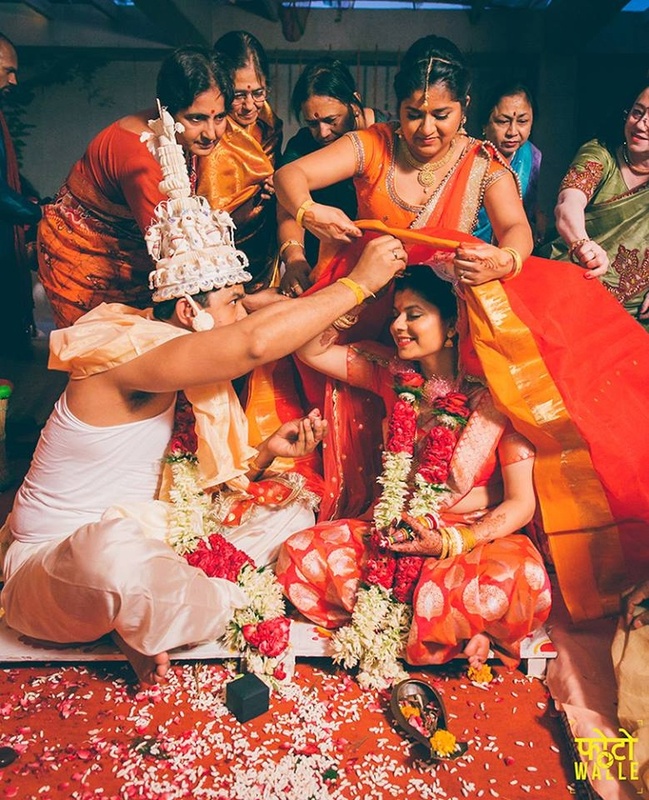 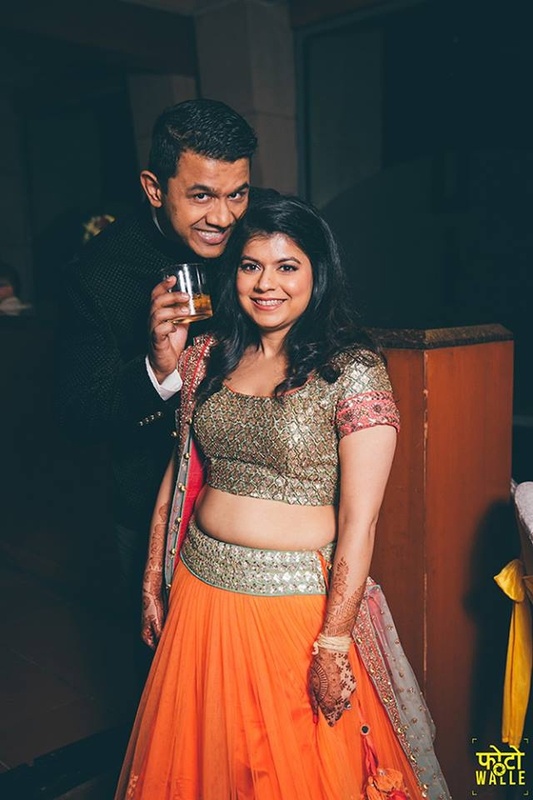 Their wedding photographers, Fotowalle captured Sid and Rupa’s simplistic wedding in all its prettiness. 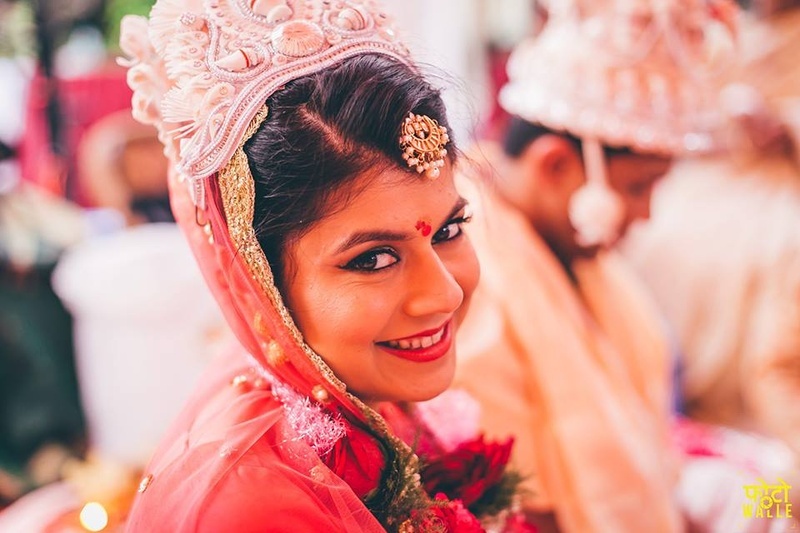 Right from capturing the detailed weaves on this stunning bride’s banarsi silk saree from Ekaya, Defence Colony, New Delhi, to those candid smiles shot during the pheras – clean photos with love gleaming right through and through! 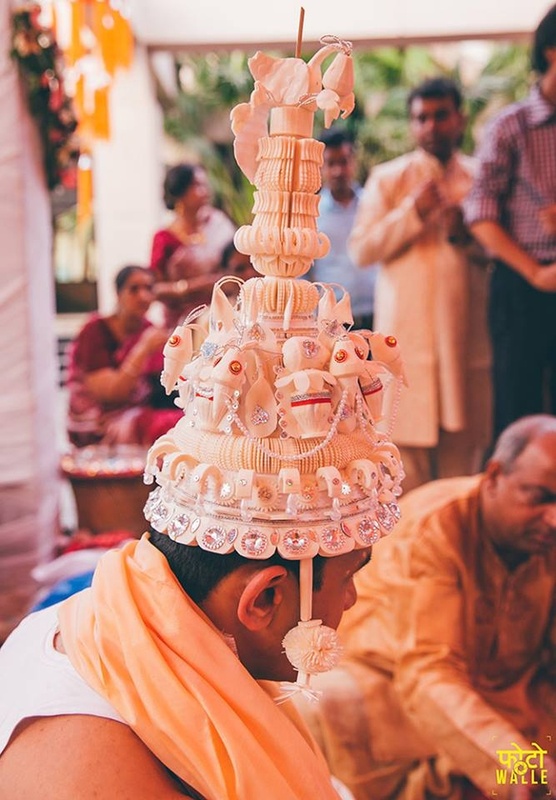 “Lots of sweet sandesh was overflowing throughout! 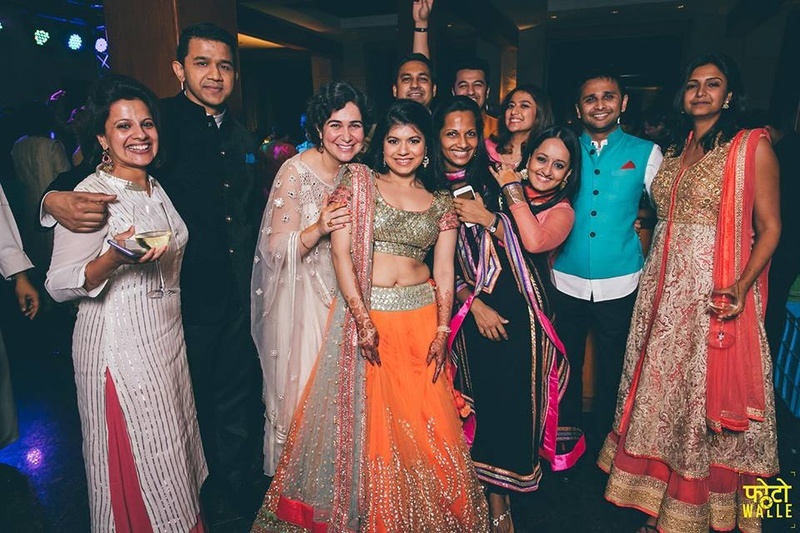 It was a delightful two days for all friends and family, so glad we met so many amazing people, the two days were a blast!” – Fotowalle! 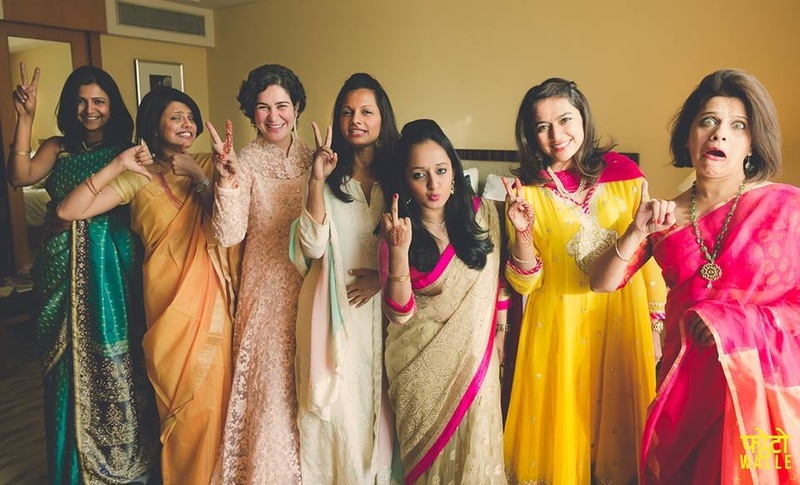 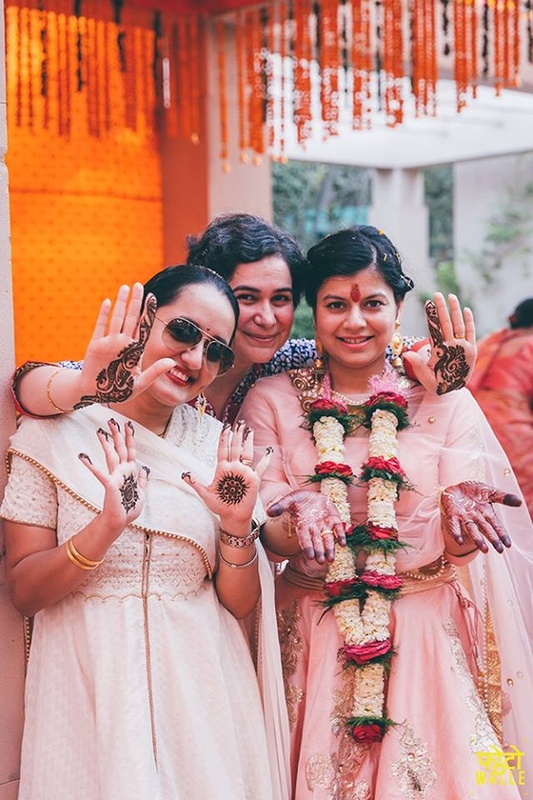 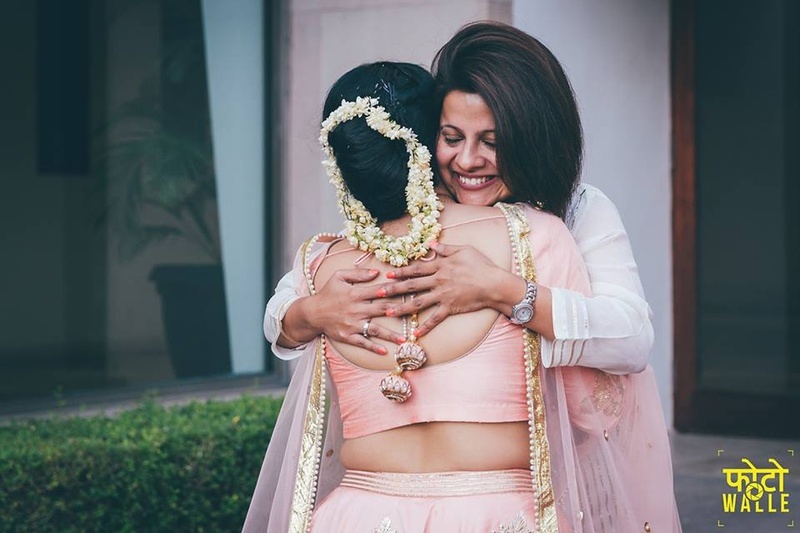 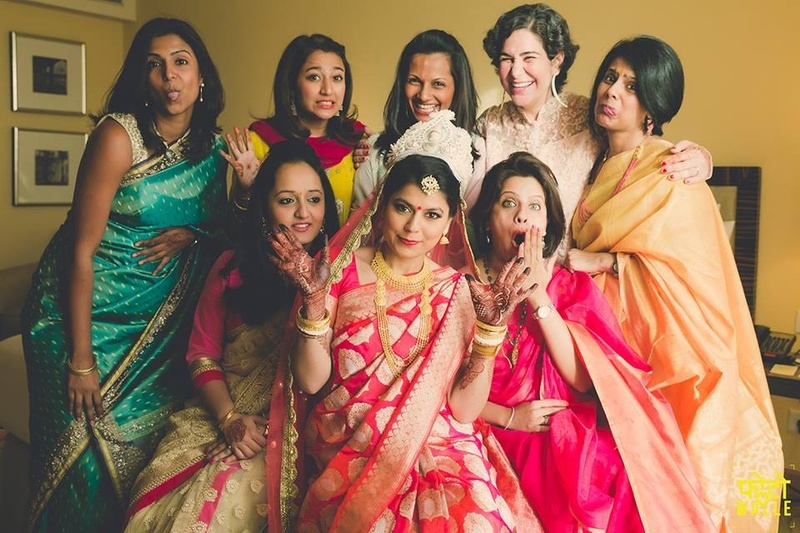 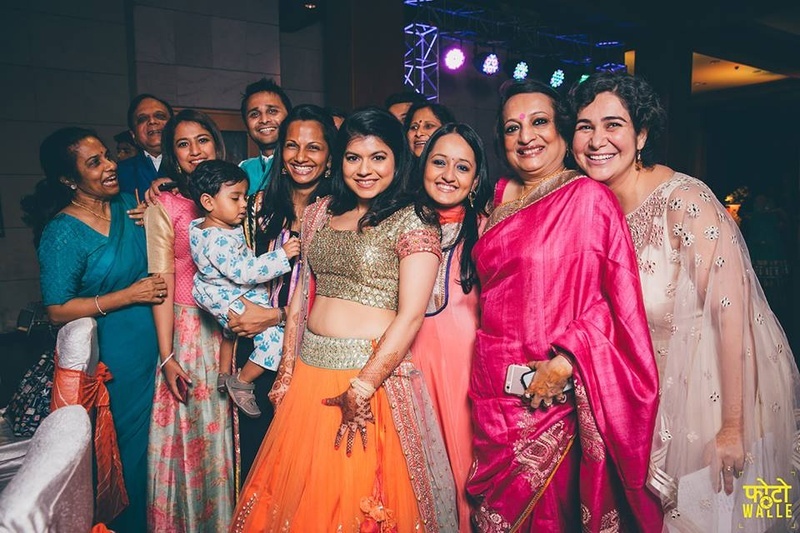 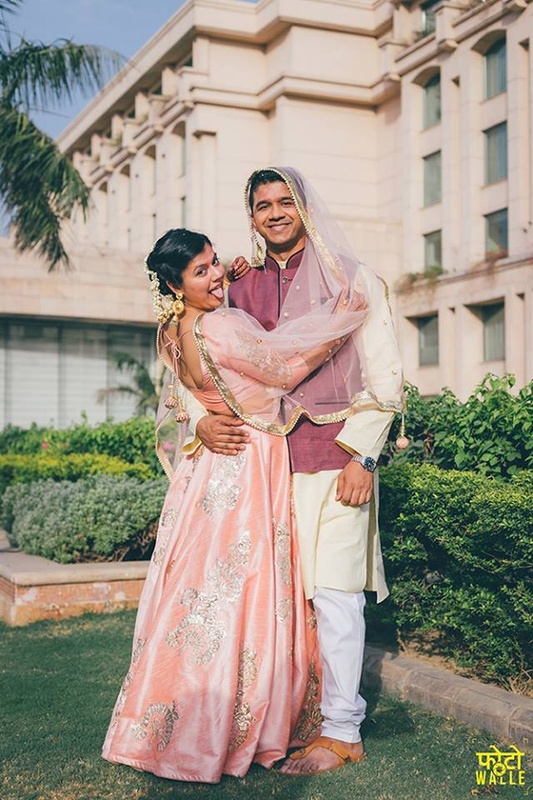 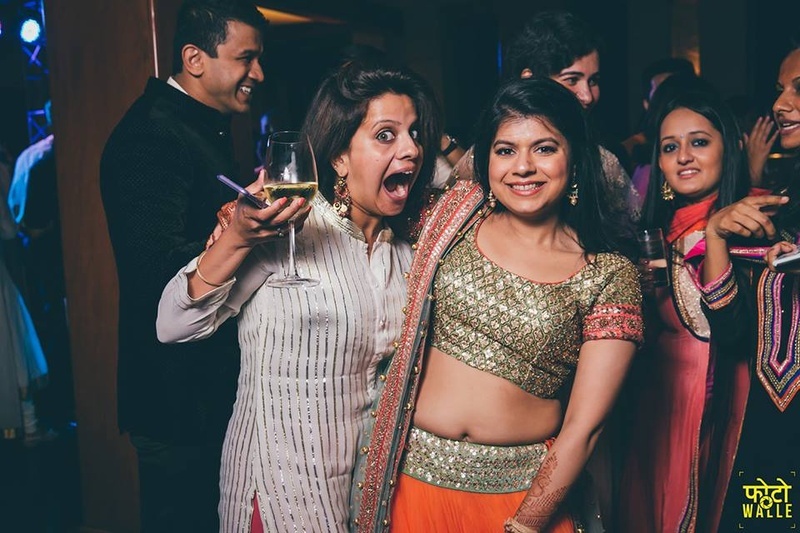 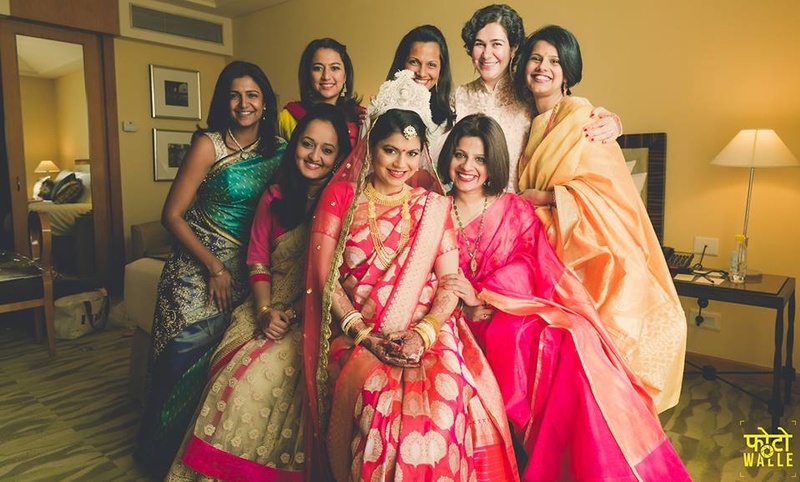 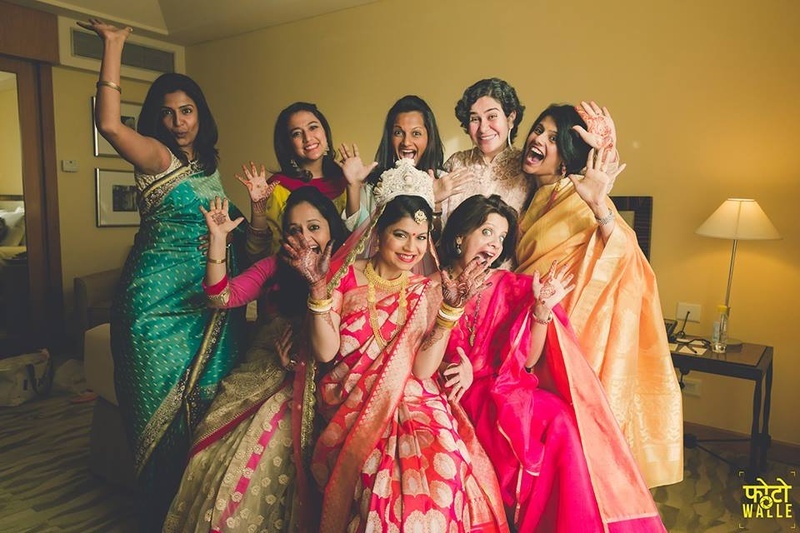 What to look out for as you scroll through this wedding – the sholawood topor worn by the bride and groom for their complete Bengali look, the all-girls must-have bridesmaid photo and Rupa’s lehenga latkan’s on her baby pink raw silk lehenga from Kani & Vikram Shahpur Jat! 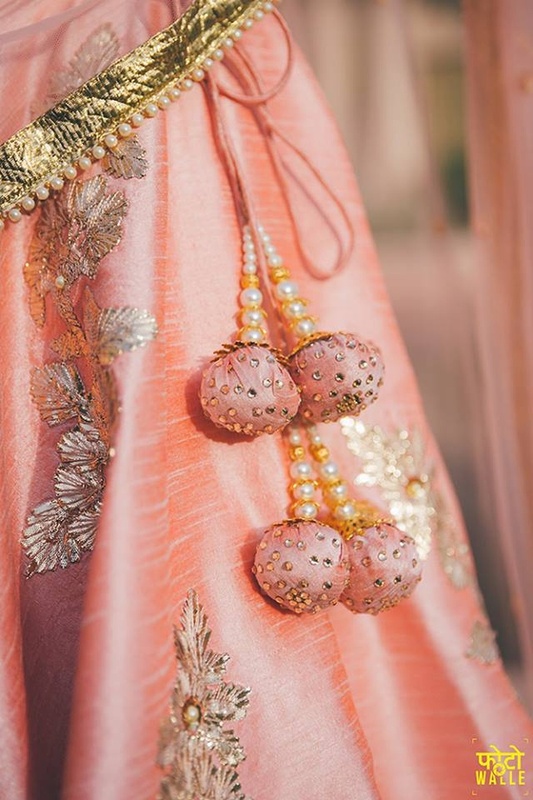 Pastel pink silk lehenga with golden and silver zari work. 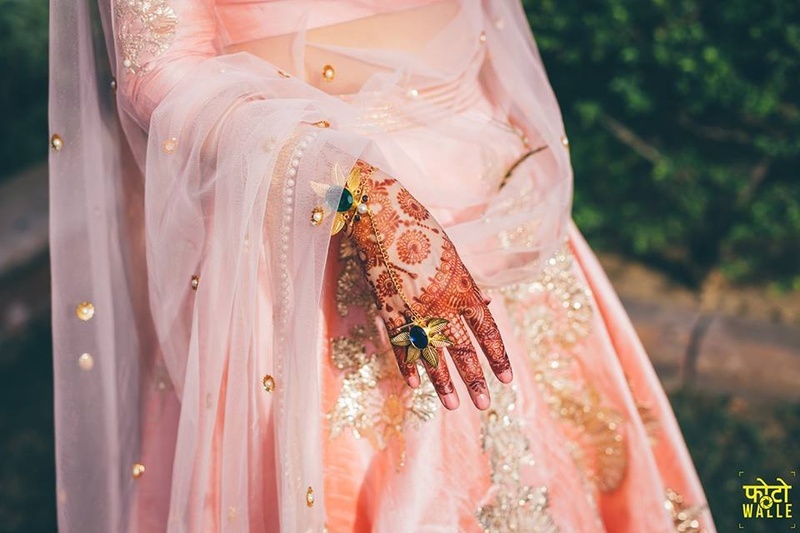 Pastel baby pink silk lehenga with silver and gold zari work for Mehendi ceremony. 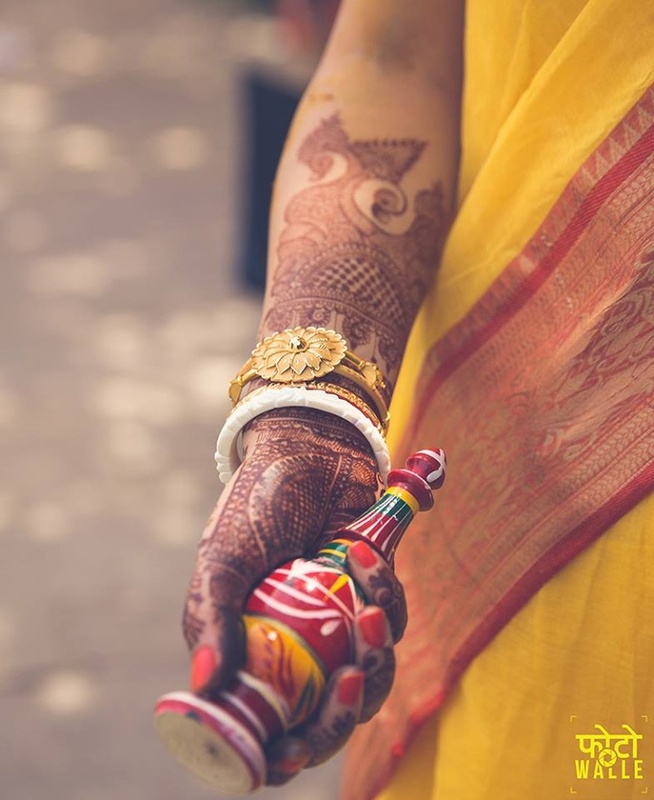 Mehendi Ceremony held at The Grand, Vasant kunj, Delhi. 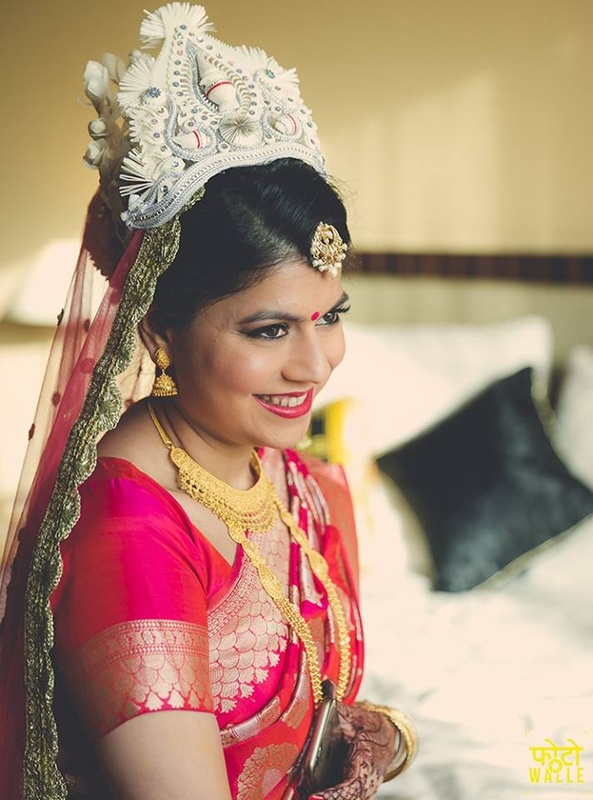 Rupa wearing gold and orange legenga with heavily gold embroidered choli and keeping it simple with no jewellery and light makeup. 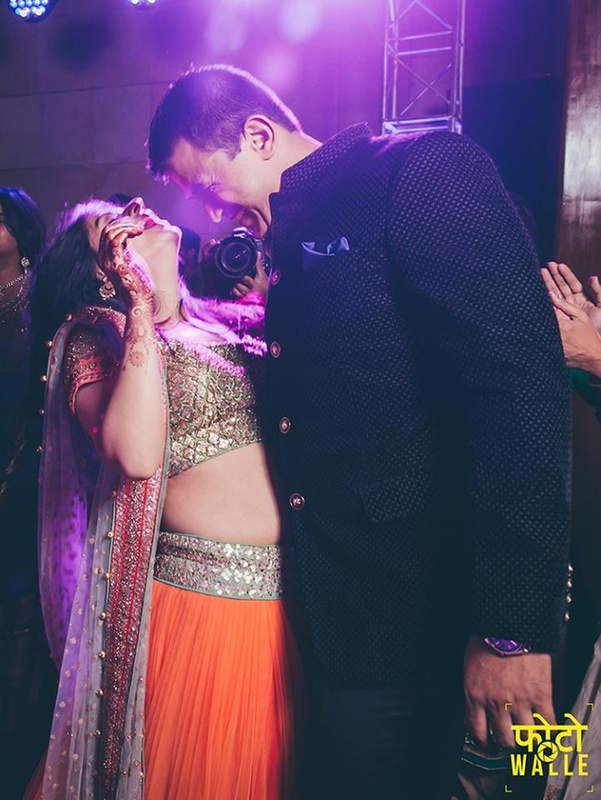 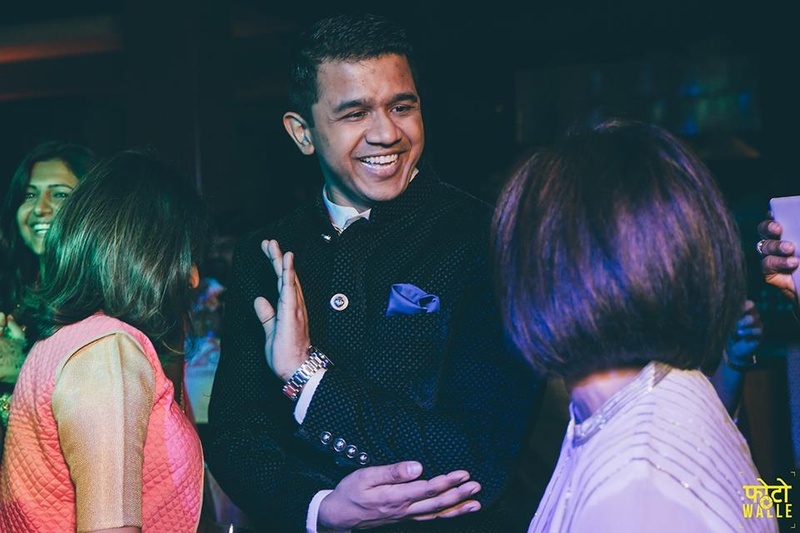 Couple dancing on their Sangeet/Cocktail night. 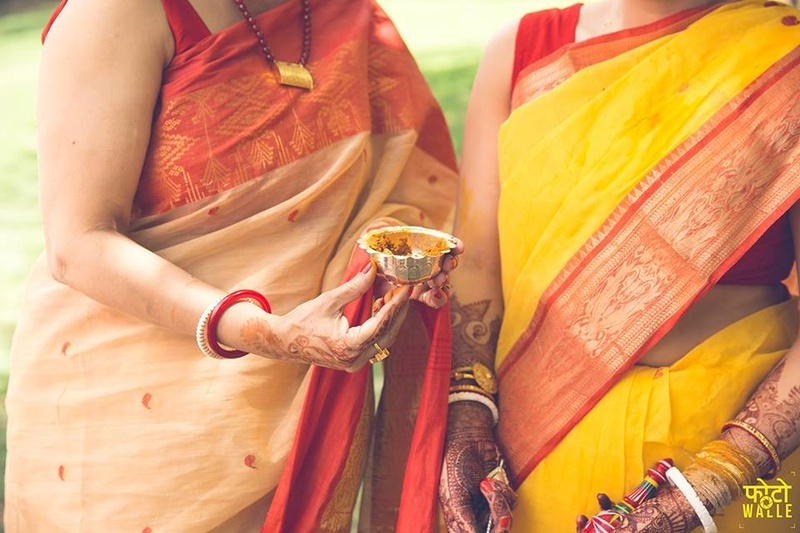 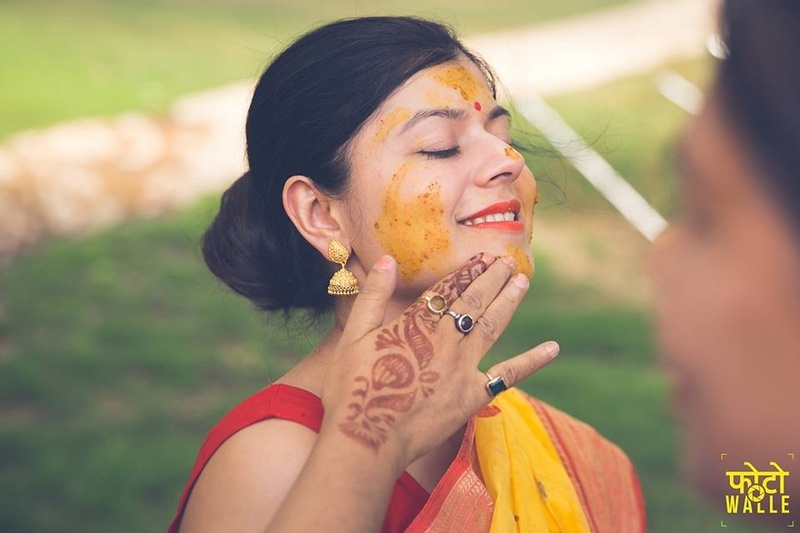 Turmeric yellow saree for Dudhi pooja and Haldi ceremony. 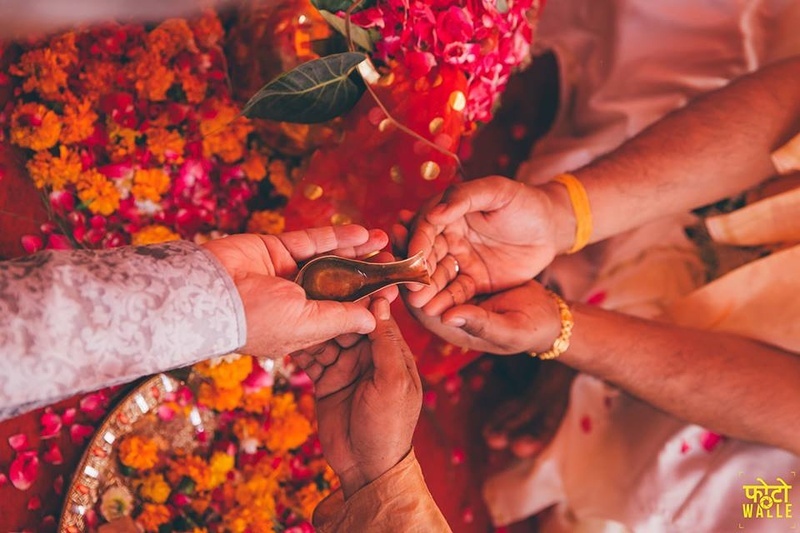 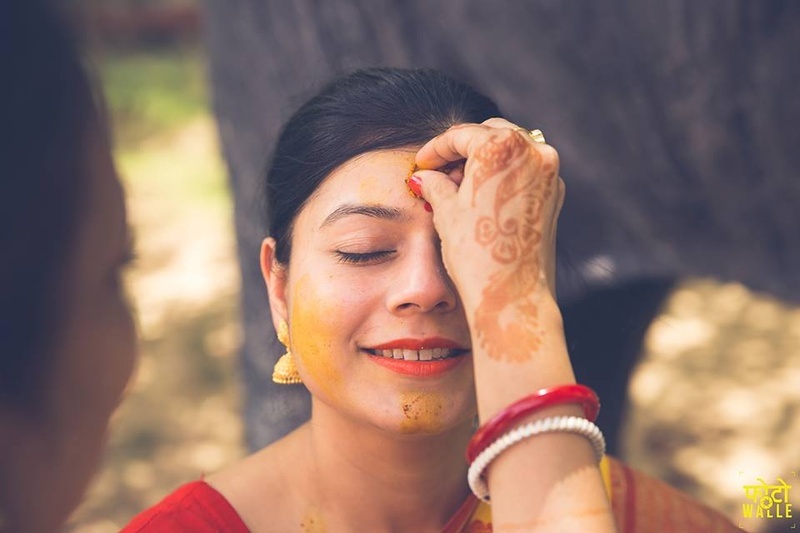 Haldi ceremony held at The Grand, Vasant kunj, Delhi. 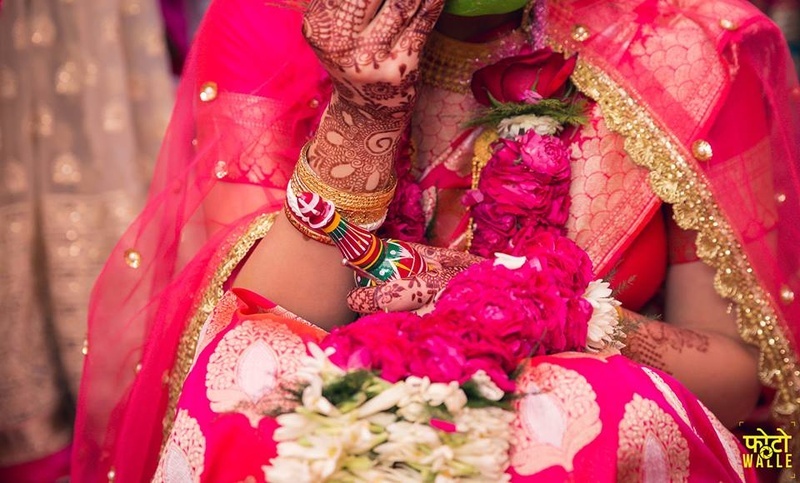 Bridal saree by Ekaya, Defence Colony, New Delhi and wedding shoes by Michael Kors. 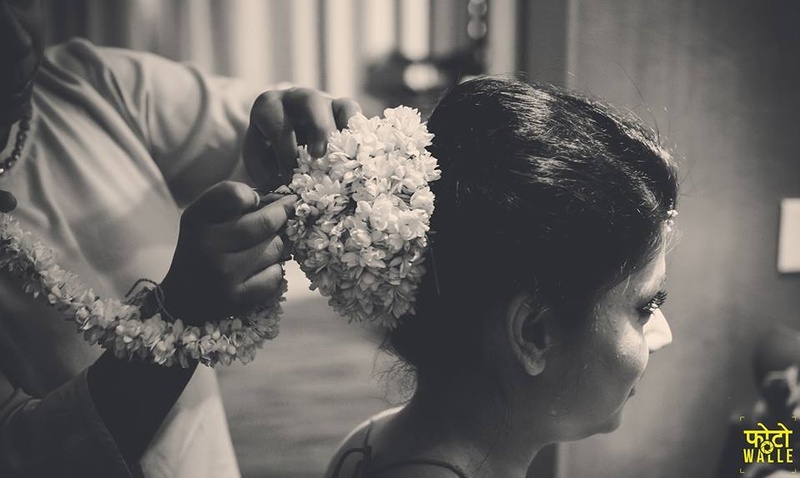 Low bun hairdo decorated with flowers for the wedding day. 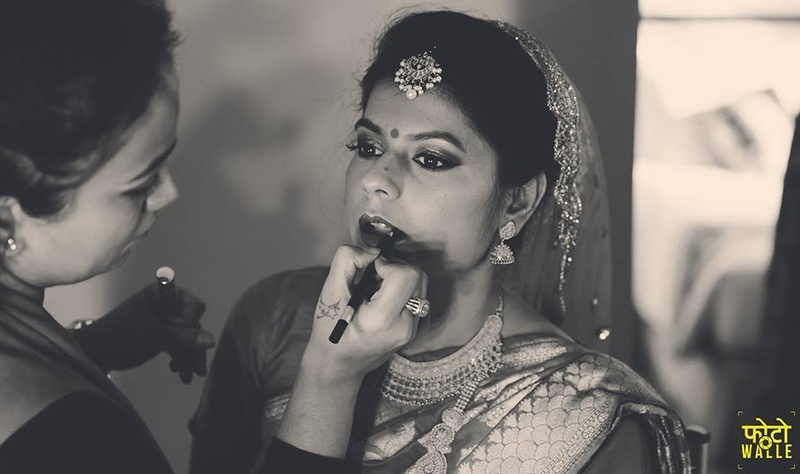 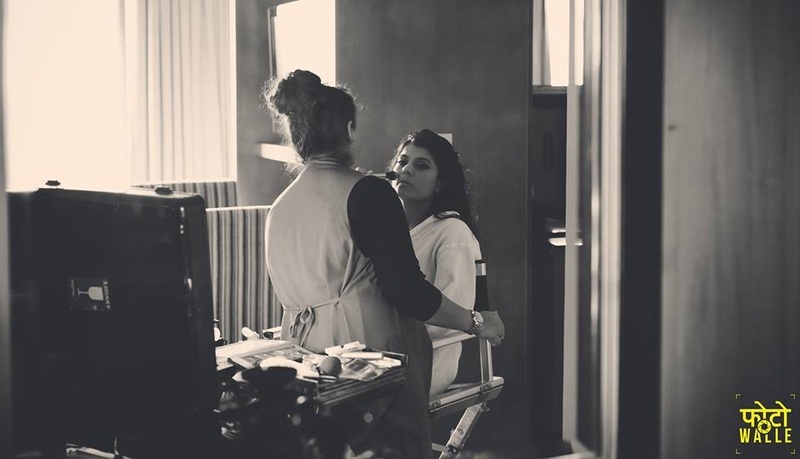 Bridal makeup by Shikha Chandra. 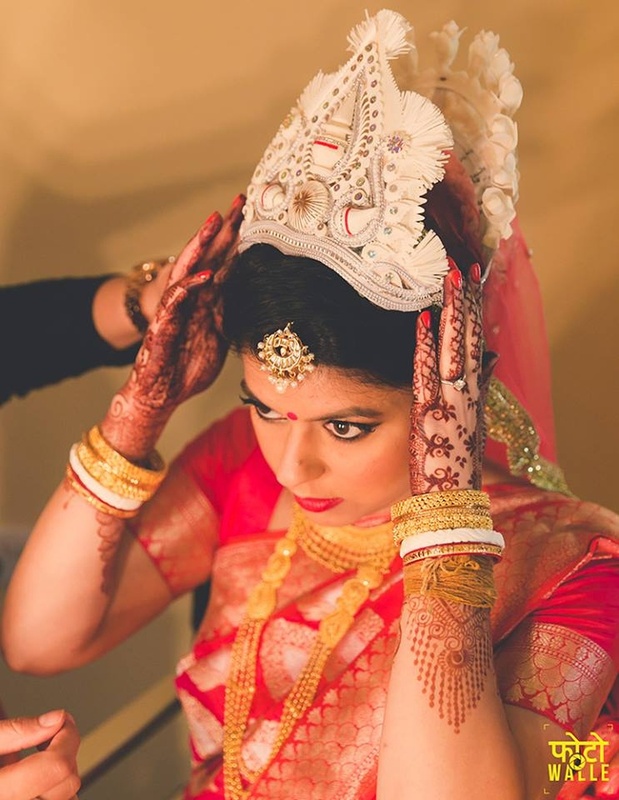 Bridal Bangali mukut with intricate design work. 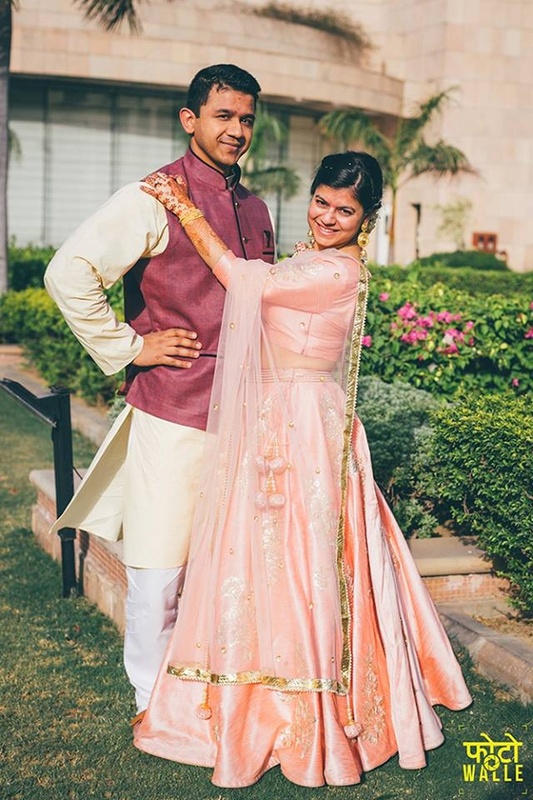 Dressed in a golden beige silk kurta with detailed intricate dori work for the wedding day. 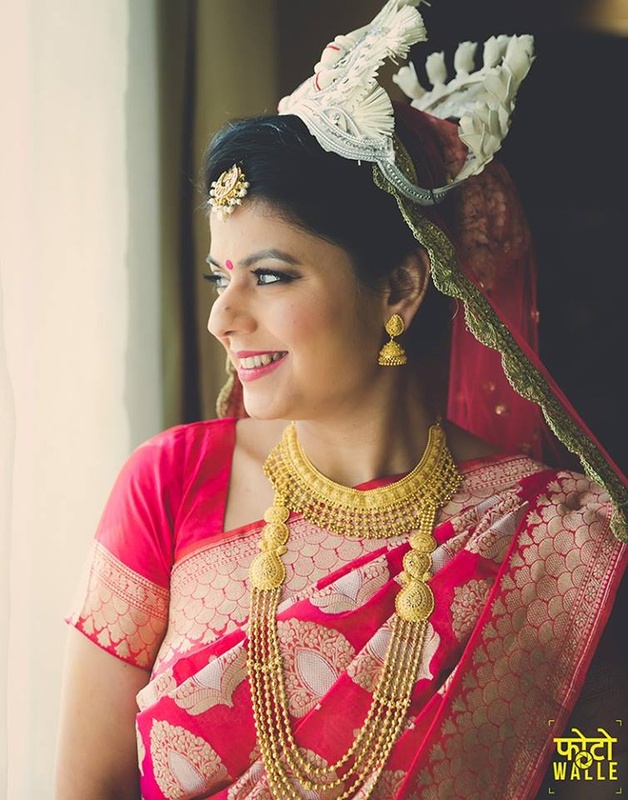 Dressed in heavy banarasi silk pink color saree with heavy golden border styled with minimal golden jewellery and white mukut wih detailed art work on it. 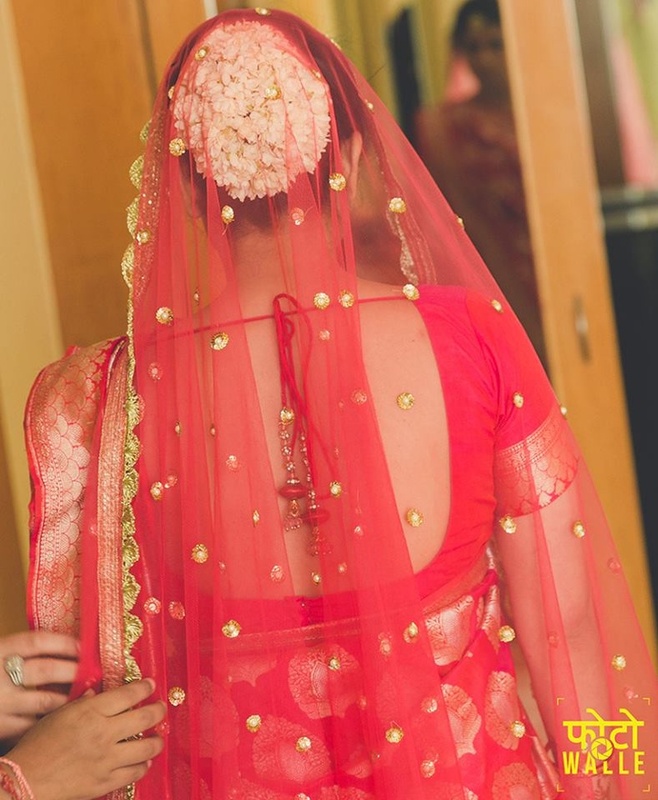 Saree styled with red net dupatta with golden patch work. 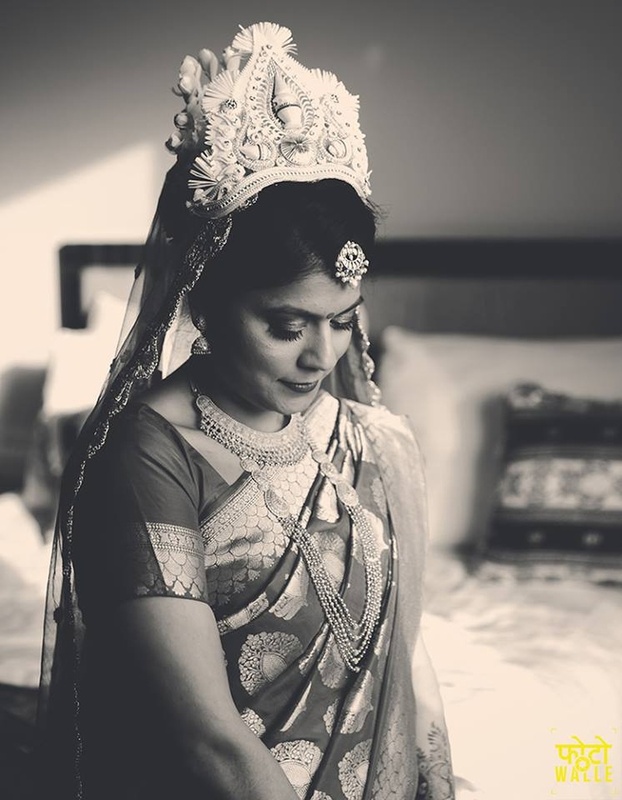 Black and white bridal photography. 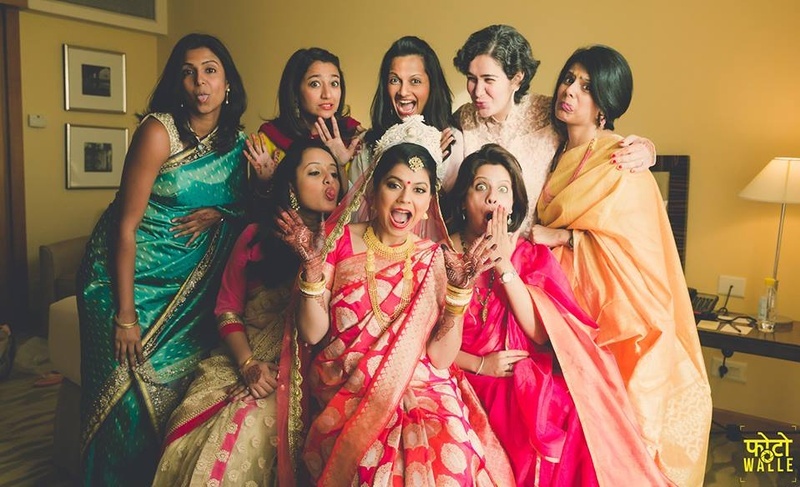 Pre wedding bride and bridemaids fun. 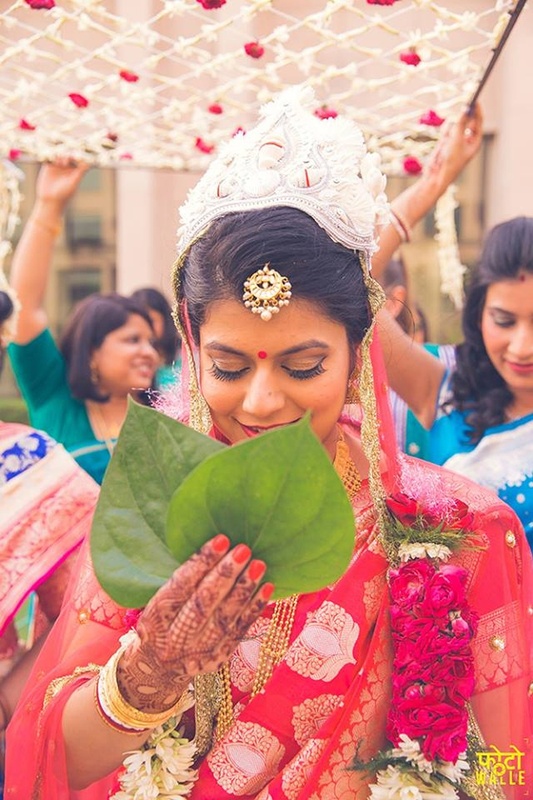 Bride entering the wedding venue. 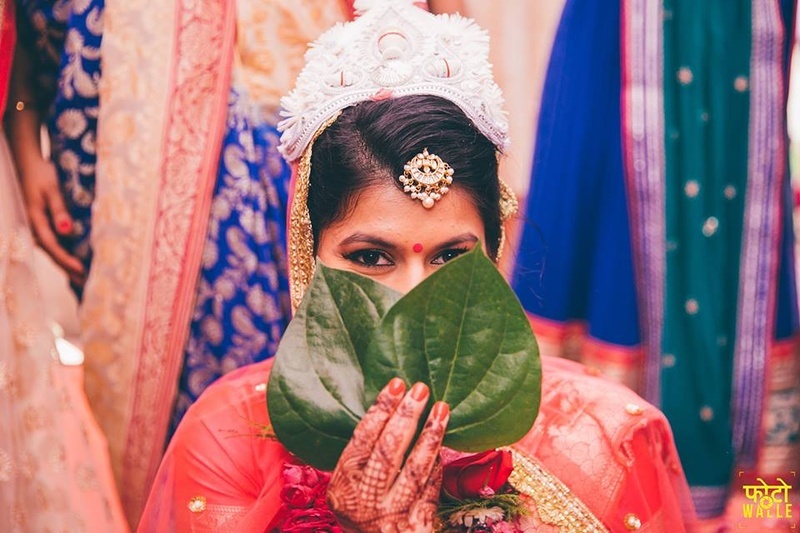 Bride's face covered with betel leaves for the subho dristi ceremony. 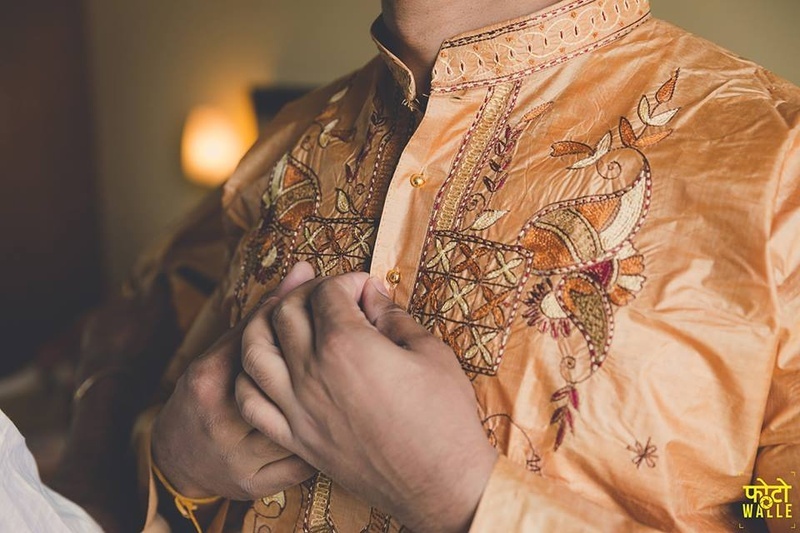 Wearing white mukut with intricate art work. 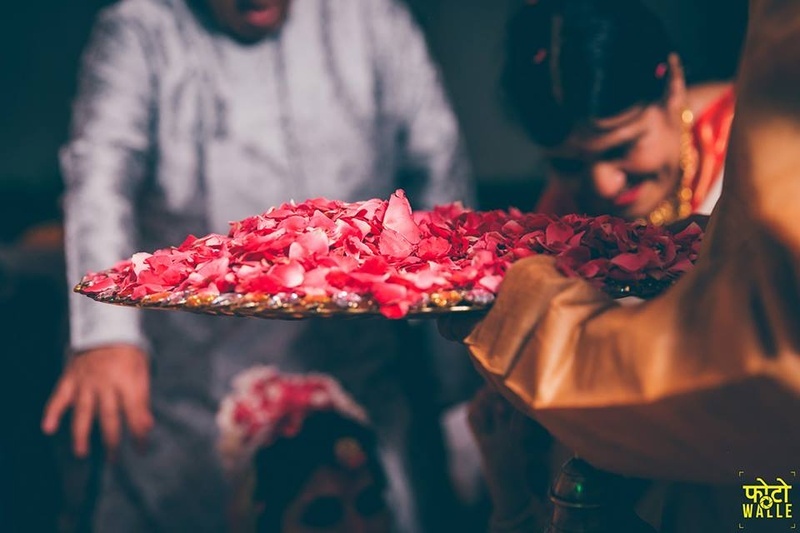 Fresh rose petals for the wedding ceremony. 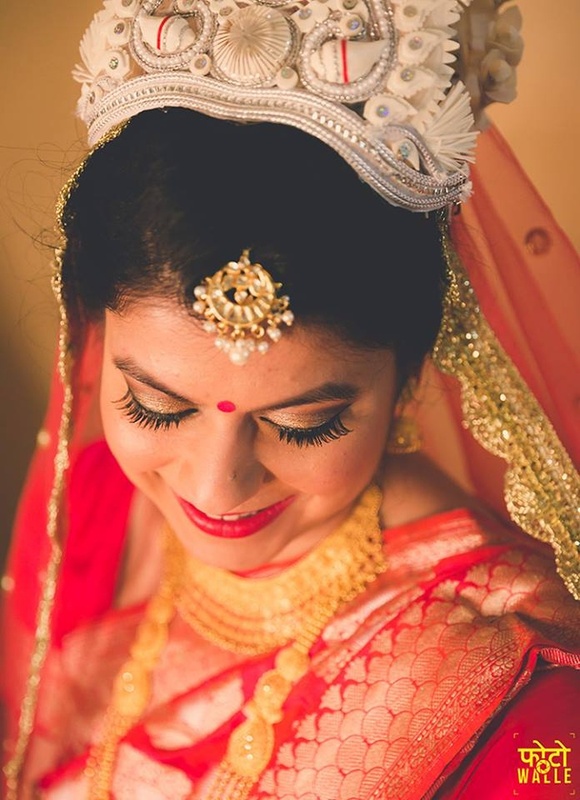 Bridal shots beautifully captured by Fotowalle. 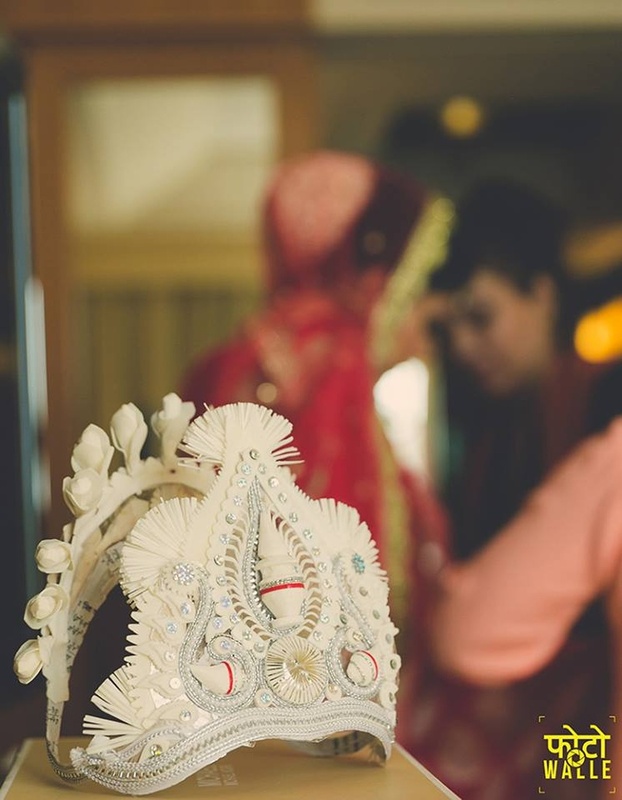 Groom's white wedding mukut with very intricate art work. 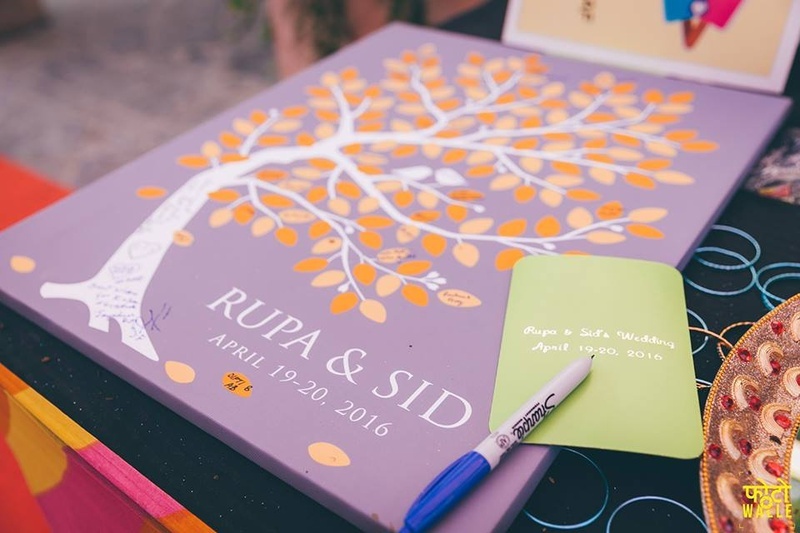 Sid and Rupa getting hitched. 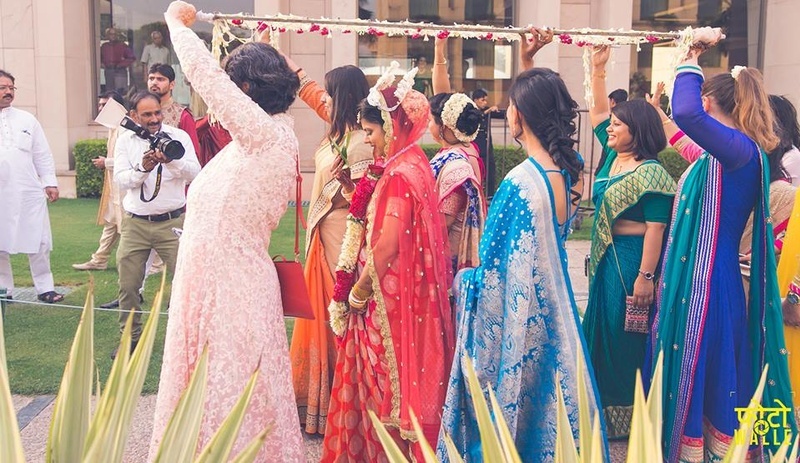 Wedding ceremony held at The Grand, Vasant kunj, Delhi. 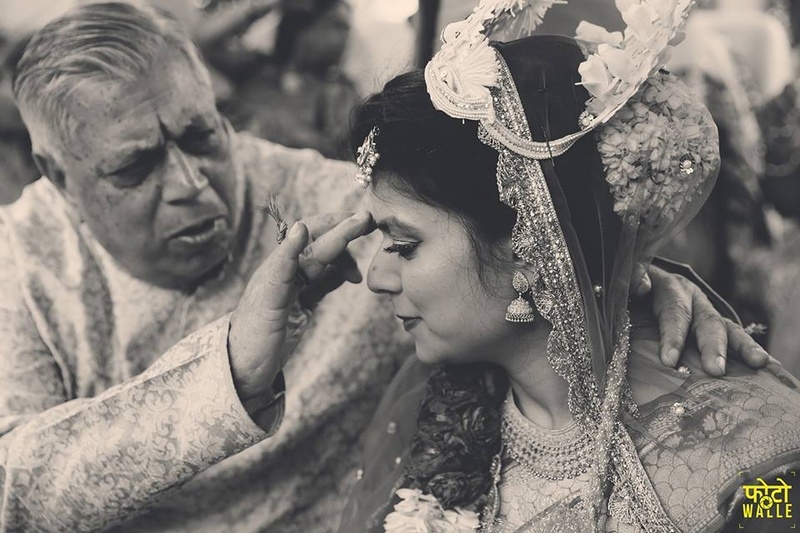 Black and white wedding photogtraphy. 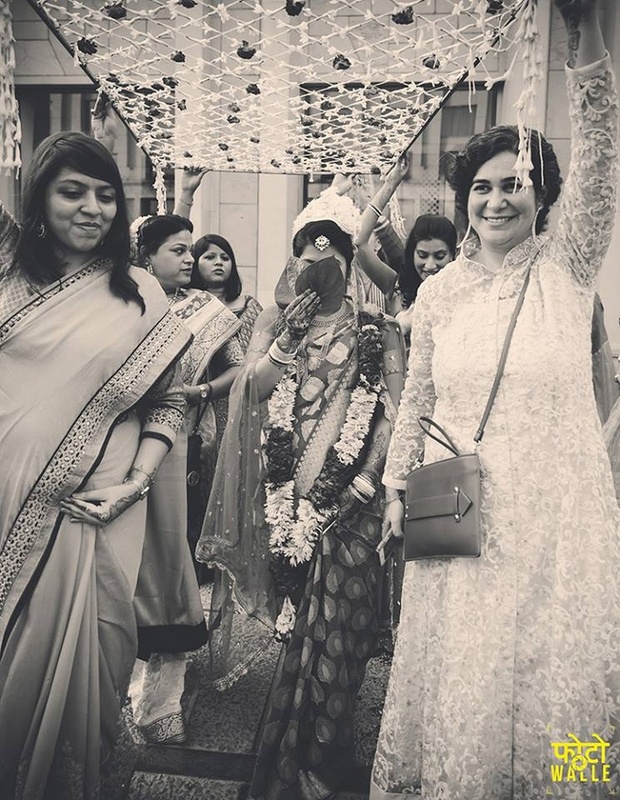 Black and White wedding couple photography.